I loved Fortress in the Eye of Time. To be honest, the first half of the book doesn’t move very fast, but you come to appreciate how C.J. Cherryh controls the flow of the story based on the progress of the main character. It’s a very interesting technique that takes a little patience to enjoy. The story centers around a young man who is called back from a distant past and who’s soul has already lived a life. His challenges in adjusting to life with no real past are very well written and yet his native intelligence and personality begin to grow quickly. The characters that surround the protagonist are fairly well written and far from perfect themselves. For me, the frailties of people are often neglected in most fiction unless it is overly depicted in the bad guy. In this case, Cherryh is very effective when describing the different supporting cast and creating reasons for them to be who they are. The story follows the political manuevering of a Prince and various factions who either want him dead or simply out of the way. The culmination of the story, when the main character begins to experience the depth of who he will be, is very exciting. On a final note, C.J. Cherryh does a good job of describing conditions that people live in without wasting too much time on trivia. It makes for a more believable read when life is a little rustic, even for the nobility. 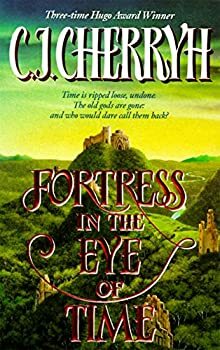 I recommend Fortress in the Eye of Time! The next three in the series are a worthwhile reward.